The renewable energy sector promises continued growth for the foreseeable future, reaching $7 trillion of expected cumulative global private-sector investment between 2012 and 2030. Despite some short-term challenges, growth is expected in each renewable energy subsector, including wind, solar, geothermal, biomass, hydropower, and renewable fuels – albeit at different rates. To better position U.S. exporters of these technologies for success in international markets, the U.S. Government launched the ambitious Renewable Energy and Energy Efficiency Export Initiative (RE4I) in December 2010. 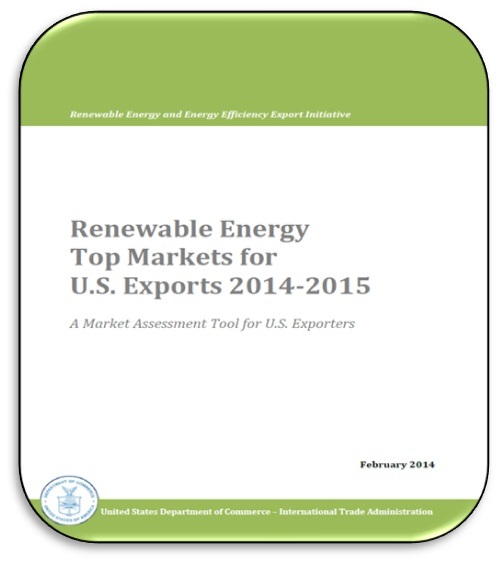 This Renewable Energy Top Markets Report is an important commitment of the RE4I. Intended to provide high-level information regarding key potential export markets for American companies, it provides a tool to steer exporters towards those markets where they may be most effective. This Top Markets report is provided as a resource for U.S. exporters by the International Trade Administration. Every effort has been made to ensure that the information presented in this report is complete and accurate as of the date of publication; however, the U.S. Government assumes no responsibility or liability for any errors or omissions. Readers are advised to independently verify any information contained in this intelligence brief prior to relying on it. The information provided in this report does not constitute legal advice. Readers are further advised to conduct their own due diligence and seek the advice of legal counsel before entering into business ventures or other commercial arrangements in this market. Tell Us How We’ve Done! We always strive to provide the most timely, useful information possible. We look forward to feedback, as we continue to promote U.S. renewable energy exports through the RE4I. For more information, please contact ITA’s Office of Energy and Environmental Industries at (202) 482-5225 or reee@trade.gov.